For three days, service workers at UC Santa Cruz vacated the dining halls, buses, medical centers and campus grounds and instead gathered at the base of campus to speak out against widening inequality in a UC-wide labor strike — the largest strike in UC history. UC students and lecturers joined in solidarity with the AFSCME 3299 demands for higher wages, better health care and increased job security across all campuses and medical centers. Support came from other UC employees and unions as well. On May 7 and 8, University Professional & Technical Employees-Communications Workers of America (UPTE-CWA) and the California Nurses Association (CNA) joined in a sympathy strike. With these unions, AFSCME patient technical care workers and the service workers all striking, the number of strikers exceeded 53,000. Students and service workers march through the crosswalk at the base of campus as part of AFSCME 3299’s three-day strike. Photo by Alonso Hernandez. Nicolas Gutierrez, a senior custodian at College Nine, is one of the 600 UCSC service workers represented by AFSCME 3299. He said he’s been involved in numerous contract negotiations with the UC and ongoing struggles for livable wages during his over 20 years working at UCSC. The strike comes after over a year of bargaining for new contracts, during which AFSCME’s demands were not met and no contractual agreements were reached. Workers across the UC voted 97 percent in favor of the strike. 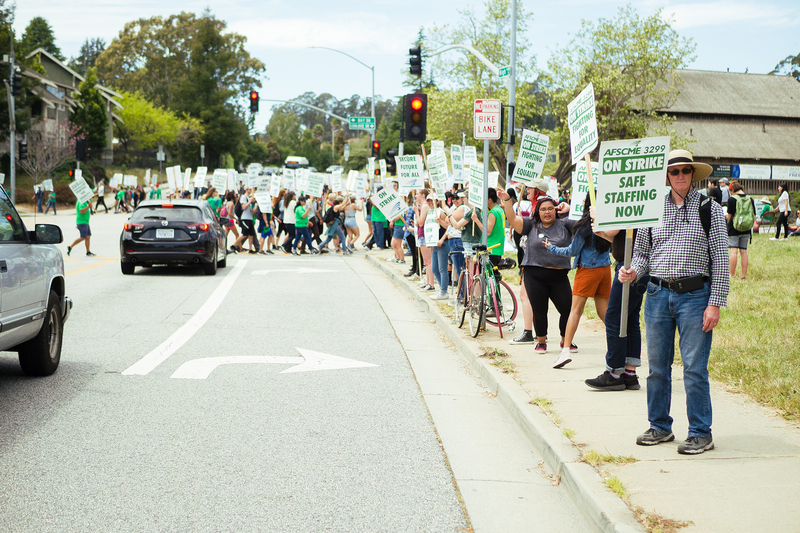 A day after the decision to strike was finalized, on April 19, the UC Office of the President proposed a contract AFSCME 3299 previously rejected. Union workers are also responding to AFSCME 3299’s Pioneering Inequality report, which revealed stark economic and pay disparities along racial and gender lines. The union’s official strike notice was delivered in person at all campuses. In the following 10 days, union members, organizers with the Worker Student Solidarity Coalition and others prepared for the strike, which was publicized to begin at 4 a.m. on May 7 and end at 4 a.m. on May 10. By 3:30 a.m. on Monday, students had already gathered and begun to block both the Main and West entrances of the UCSC campus. Workers joined shortly after, at about 4 a.m.
AFSCME 3299 union members are not allowed to block campus as part of a strike, as mandated in their contract, which expired on June 30, 2017 but remains in effect until a new one is signed. Union members stayed at the base of campus, using crosswalks to picket without blocking traffic. Students attempting to block campus emphasized that their actions were in support but independent of the union’s picketing. At the base of campus, crowds numbered about 350 at each day’s peak. The picketing was punctuated by mid-day rallies, which incorporated community building, music and dancing among workers, students and other supporters. Lecturers, students and workers in solidarity spoke about the importance of livable wages and a UC that respects its workers. Throughout the strike, the UC’s position on the contract offer and strike remained the same. AFSCME 3299 maintains its intentions were not to target students and patients. Union spokesperson John de los Angeles said the union organized patient protection task forces at medical centers in case of emergency. At UCSC, students organized alternative ways to access food during the strike, including additional hours for the on-campus SUA food pantry, and union members provided meals for all participants each day as well. In response to AFSCME’s demands for a 6 percent raise each year, the UC said this is more than raises generally provided to other employees. But union members find this stance doesn’t account for service workers’ lower baseline salaries — AFSCME 3299 represents the lowest paid workers in the UC. AFSCME 3299 interns Sabina Wildman and Sarahí Gonzalez Ramirez have been preparing for the strike and helping with other actions since January. Gonzalez Ramirez accredited her instant connection to the union to her mother’s experience working as a janitor. Sarahí Gonzalez Ramirez leads a chant at UC Santa Cruz during AFSCME 3299’s UC-wide strike. Collaboration between student activists and and AFSCME workers was essential in bringing awareness to workers’ issues. Photo by Lindsey Vande Wege. Many other students resonated with this connection and spoke of feeling like the workers were family. During a rally on May 8, Student Union Assembly President Max Jimenez spoke about her proximity to workers’ issues. Students recognized similarities between the workers’ struggles and their own. Students in solidarity with AFSCME gather to lead chants at the divider at the base of campus as protesters picket, circling the crosswalks. Photo by Alonso Hernandez. Workers expressed feelings of gratitude for the student support and acknowledged that students are the reason they enjoy and do their jobs, not the administration. Early morning hours of May 7 saw high tension and confrontation between police and students. About 125 police officers from the UCSC Police Department, Santa Cruz Police Department and California Highway Patrol were present on and around campus during the 3-day strike, said UCSC Police Department Chief Nader Oweis. The officers prevented students from completely shutting campus down. They did so by using “tactical lines” to separate protesters and issuing dispersal orders, so students could not remain in the streets. At the West Entrance, starting at about 5:20 a.m. police broke protesters apart and separated them on each side of the street. About 12 students were cited for “vehicle code violations” throughout the day. Police arrested two students, Jeremy Saunders for felony assault on an officer and Juan Davil-Santiago for a misdemeanor of obstructing an officer. 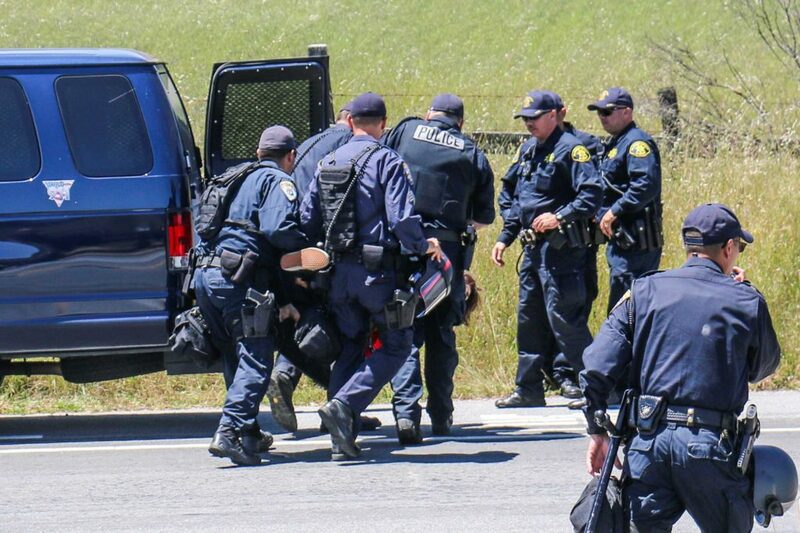 When UC Police Department arrested UCSC student Saunders for felony assault, four police officers carried him by his hands and feet into a van. AFSCME 3299 member and bus driver Kevin Parks, who witnessed the arrest, claimed Saunders had unintentionally bumped into the officer from behind as the student walked by carrying a speaker. Second-year student Jeremy Saunders is taken into the back of a police van at the picket line located on the West Entrance. Saunders was charged with felony assault on an officer after he allegedly bumped into a police officer while crossing the street. Photo by Lindsey Vande Wege. At the East Entrance, by about 6 a.m. on May 7 students moved up from blocking the road near the base of campus to the intersection of Coolidge and Hagar drives, where they walked in a continuous circle, attempting to block traffic. After a car slowly proceeded into some of the students, hitting them but not injuring any, they linked arms to form a diagonal line. Police did not respond to this incident. About 30 minutes later, officers issued a dispersal order. No arrests or citations were made at the East Entrance. Student protesters at both entrances were upset and frustrated by the level of police presence. “The level of police presence […] for an action that directly is in support of people of color, low-income communities, Black and brown communities, is extremely troublesome,” said SUA Vice President of Diversity and Inclusion Katherine Lȇ. Police officers and protesters meet at the West Entrance, where two arrests were made. UCSC Police Department brought officers from various jurisdictions across the state to help manage the strike. Photo by Lindsey Vande Wege. Union members and representatives shared similar sentiments. Traffic was flowing in and out of campus at both entrances by 6:45 a.m. on May 7 and students moved from Coolidge and Hagar drives, on the east side, to the base. Loop buses, however did not run. The METRO bus drivers’ union chose to respect the picket line and members did not drive further than the base of campus for all three days. Classes before noon on Monday were canceled. By 1 p.m. on Monday, students from the West Entrance also convened with workers at the base of campus, garnering a crowd of about 350. This was decided after the second arrest because students felt the heavy police presence made it unsafe to remain on the west side of campus. On Tuesday morning, a small group of students, self-proclaimed as autonomous of the union, attempted to block the West Entrance starting at about 6 a.m. Cars still drove through as police officers separated protesters onto the sidewalks each time one approached. 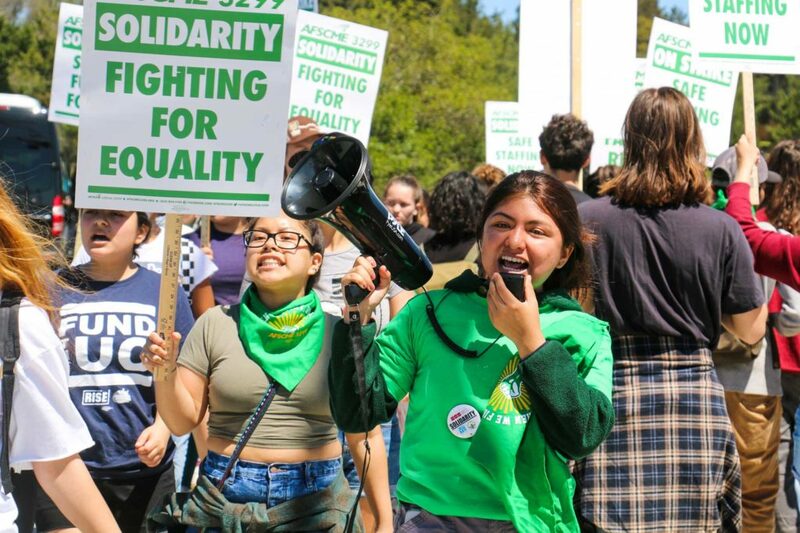 Sabina Wildman, AFSCME 3299 intern and UCSC third-year, approached the group and explained that the union wanted to avoid more student arrests and preferred the students join the strikers at the base. After some discussion, the students left the entrance to join at the base. 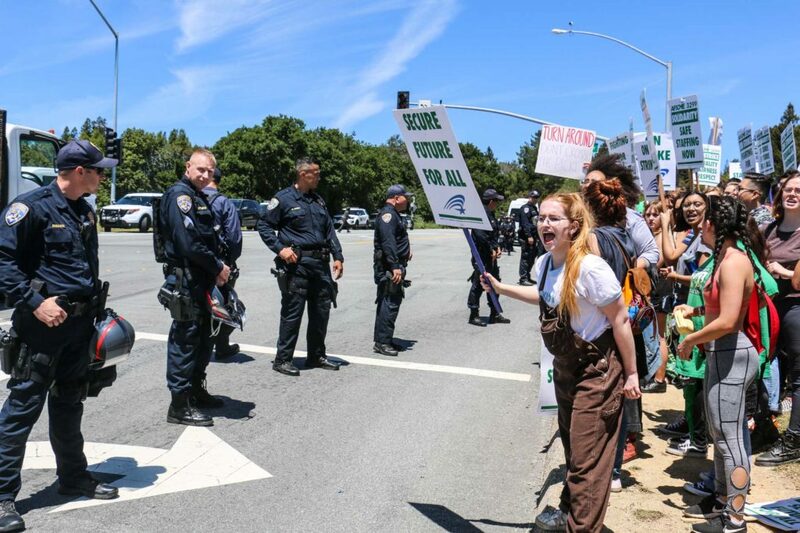 No citations or arrests were made at the protest on Tuesday or Wednesday but the number of police officers present remained the same, said UCSC director of media relations Scott Hernandez-Jason. The strike is over, with no new offer or concessions from the UC, but AFSCME 3299 doesn’t consider this fight to be over. 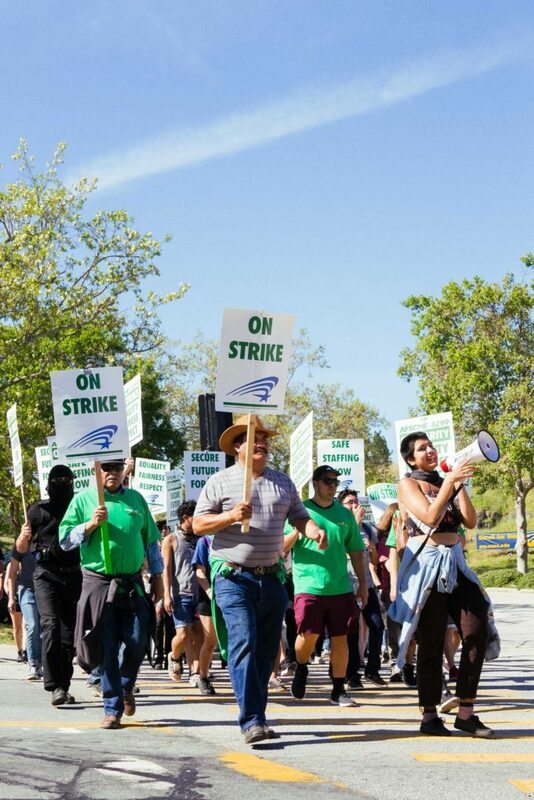 As it stands, the UC has informed the union that it will implement its current offer this summer, said AFSCME 3299 spokesperson John de los Angeles. If the union chooses to strike again, it will be a decision first reached by the bargaining team and the union would once again need to provide a 10-day official notice to the UC. Although next steps are uncertain, workers and students are ready to continue. Additional reporting by City on a Hill Press staff.